Cake: Preheat oven to 350°F. Mix sugar, flour, cocoa powder, baking soda, baking powder, and salt. Stir in eggs one at a time. Add the milk, vegetable oil, and vanilla extract and mix. Now add the boiling water and mix. Spray two round 9" diameter baking pans with nonstick spray. Pour your batter into the two pans, splitting it equally between them. Place pans in oven and bake 30-35 minutes, or until a toothpick comes out clean. 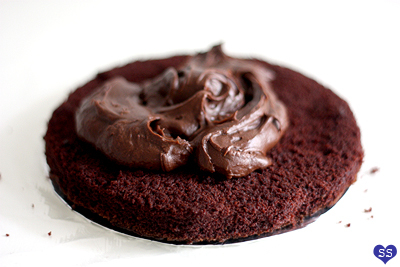 Remove cakes from oven and let cool in pans for 10 minutes. Then, carefully transfer the cakes to a cooling rack to finish cooling. When the cakes are totally cool and you're ready to decorate them, take a knife and slice them in half like a hamburger bun so you end up with four circular cake layers. 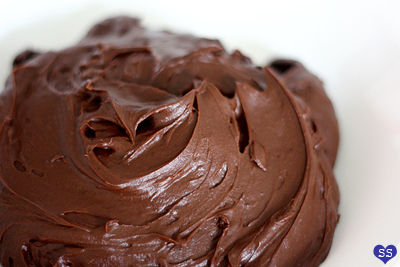 Chocolate Frosting: Mix the cocoa powder and powdered sugar together. In another bowl, cream butter until fluffy. Mix in 1/3 of the cocoa/sugar mixture. Add about 1/3 of the milk. Repeat this until all the cocoa powder, sugar, and milk are added. Mix in the vanilla extract. The frosting should be spreadable at this point. If not, add in more milk or powdered sugar as needed. Vanilla Frosting: Cream the butter until fluffy. Mix in 1/2 of the powdered sugar. Add 1/2 of the milk. Repeat with other 1/2 of sugar and milk. Add in the vanilla extract. The frosting should be spreadable at this point. If not, add in more milk or powdered sugar as needed. Now scoop out a portion of the frosting to a separate bowl (enough for the frosting letters). 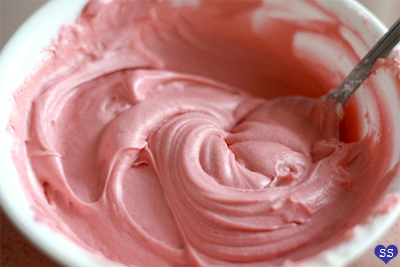 Add a few drops of red food coloring to the remainder of the frosting and mix to get pink frosting. In the other bowl, add green food coloring to get green frosting. Keep bowl covered until ready to use. 1. Cover your work surface with a sheet of plastic wrap. Cut out a circle from a piece of cardboard and cover it with foil. Place it on your plastic wrap, followed by your first layer of cake. 2. Dollop some frosting on the cake and then smooth it out. 3. 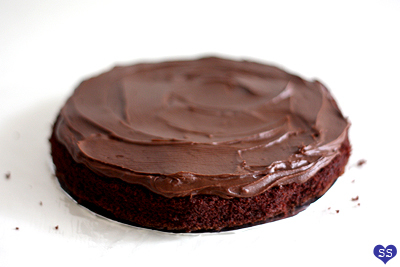 Place another cake later on the first, dollop frosting, and smooth. 4. Repeat process with third layer of cake. 5. Place final cake layer on top. 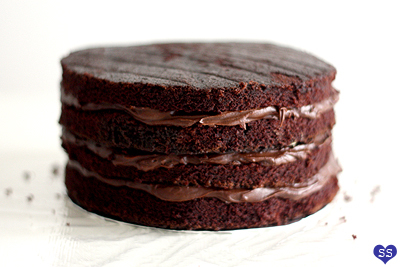 Press down on top of cake to make sure firmly sandwiched. Wipe off the crumbs dotting your plastic wrap. 6. 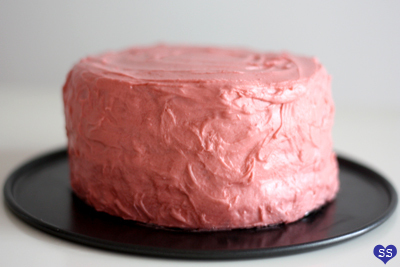 Take your pink vanilla frosting and start your crumb coat by thinly coating the top of the cake. 7. Continue the crumb coat on the sides of the cake, making sure to get it fully covered. Don't worry if it looks ugly at this point. You can carefully move the cake onto a plate if desired. 8. 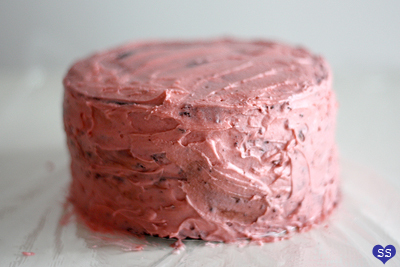 Clean off your knife and apply a second layer of pink frosting. 9. 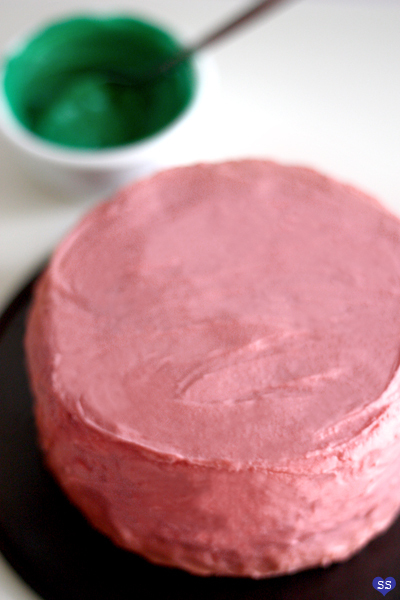 Put your green frosting it in a piping bag (or plastic bag) and cut a hole at the tip. Pipe on "Happee Birthdae Harry" and you're done! Follow recipe above, except instead of using two 9" cake pans, use one 12 1/4 x 9 1/8 inch (31.1 x 20.6 cm) rectangular sheet pan. Bake for 30 minutes or until a toothpick comes out clean. Let cool on metal rack. Once cool, flip the cake onto a clean, flat surface covered with plastic wrap. What a cute idea :)You've done a fabulous job with this cake! Hagrid would be proud! Thanks for sharing! Anonymous: Yup, haven't updated in a while. Yes, make it! shaz: Actually I still need to watch to movie, but I'm pretty sure after I see it I will be :'(. Your comment totally makes me think of Lupin and his theory that chocolate cures all. Erin: I was actually having difficulty thinking of something to make this time around since I've already made a lot of the usual HP food. 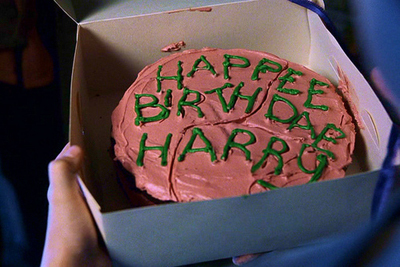 But then I remembered this cake from the first book/movie and thought it'd be perfect to go back to the beginning to celebrate the end. The Harried Cook: Hehe, thank you! Love this! I've yet to get to the movie...I'm just not ready to admit its over. :( Plus I was waiting so the theater wouldn't be as crowded and less people would see/hear me cry!! Hello!!! Just letting you know that I love your blog and all your stuff is super cute! Just one question. Im making this cake as we speak and I am slightly confused. I did everything exactly as written and it was looking great untill I had to add the boiling water. Is it supposed to look so... well, watery? Lol. Such a cute cake! I love the tribute. I miss Harry already! Never mind!!!! Im making the recipe for cupcakes and the frist batch just came out of the oven and they are PERFECT!!! Yay im so excited!! Thanks for the awesome recipe!!!!!! Haha, I'm watching HP and the philosophers stone right now! I am definitellyy going to be trying that cake recipe! if it looks even half as deliciously wonderful as yours then i will be elated! Superjaxter: Aww. I'm sure that there will be plenty of people tearing up in the theater; it's the end of the HP era! Anonymous: Yes it is supposed to be watery. Haha, I had your exact same reaction! Pre-water, perfect looking cake batter consistency. Post-water, uhhh what? But it ended up baking up beautifully so it's all good. Now I'm curious about what the point of the boiling water is! But glad to hear it was a success. Mary: Thanks! I'm sure I'll miss it too after watching it this Friday :(. Frk. Overballe: Awesome! You can see the actual cake in the movie :). The Procrastobaker: Yeah, try it out! It's very simple and bakes up wonderfully! Okay, this I have to try. This is cute! Thankfully, I won't be in HP grief until after it comes out on DVD. I am NOT a theatre person. Theatres and me don't get along. Cute cake :D Hope you enjoyed the movie--we saw it (twice!) opening weekend and as expected, totally cried. I think almost the entire theater was crying, hehe. I want to make 3in cakes with this recipe for a dinner party I'm having. What size sheet cake pan did you use? The directions say "one x inch rectangular sheet pan"; 9x13, 12x15, etc.? Thanks! Katie: Yay, try it :). I'm looking forward to seeing it on DVD, part 1 and part 2 together. 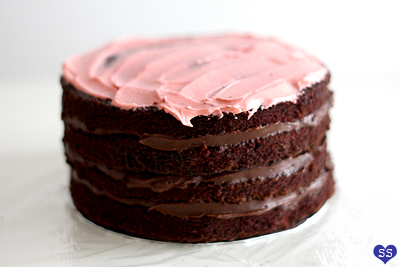 Mel: I can imagine, mini layers of chocolate cake with a bit of pink frosting and a mini frosting flower to top it off. tofugirl: Yup, saw it this weekend. It was pretty good! I definitely teared up, and I'm someone who pretty much never cries during movies. JenB: Hehe, that sounds adorable. I just updated it above. Thanks for the reminder! I knew I forgot to post something in the recipe. It was a 12x8 inch pan. A 9x13 pan should work as well. 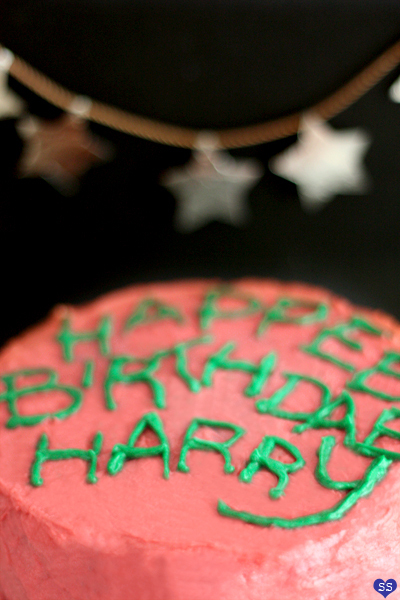 I love the beautiful colours of the frosting. Looks so good. Hi ! I love your cute cookies and lovely cakes ! This is so accurate! 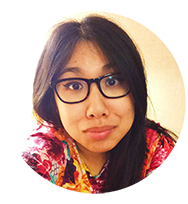 I love Harry Potter and I love your blog! Hi there, your blog is adorable! I am about to start one myself. I am also a recent graduate and love baking on the side, while searching for a career job! 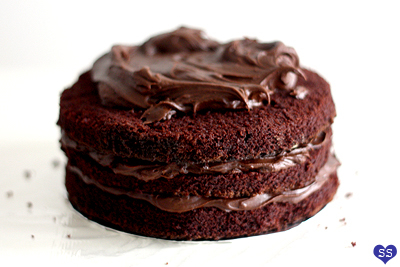 Your chocolate cake recipe is very similar to mine. To enhance the chocolate flavor, I add a tsp of instant espresso to my boiling water before adding to the mixture. You should try it some time :) Happy baking! Stirling, Berry, Anonymous 1: Thanks! coffeerocketfairytale: Yes, I agree! After seeing the movie, I was in a total Harry Potter mindset for days. Anonymous 2: Mmm, chocolate cake and caramel sauce sounds wonderful together. Thanks for the coffee tip! Damar: Definitely try it out. It's not too difficult and it tastes great. Anonymous 3: I will try that out sometime! Good luck with the new blog and the job search. 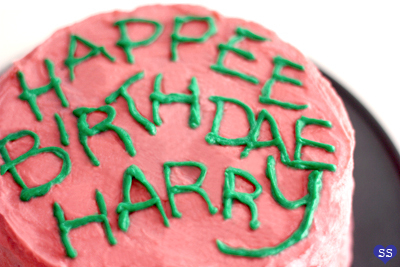 i've never made an entire cake from scratch before and i was having a harry potter birthday party so i figured this was perfect for my cake (yes i made my own birthday cake). can i just say this is hands down the best cake ever. everyone was in love with it and i think i'm now expected to make it for any event in the future. 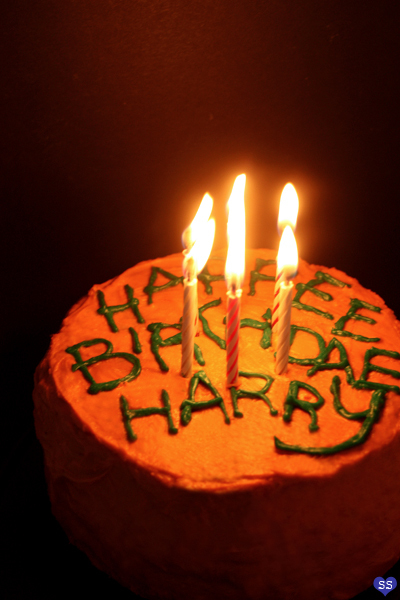 My sons just got done reading the very first Harry Potter book and tonight we are watching the movie, so what a better way to celebrate than a cake for Harry Potter for dinner! Oh my gosh. I love you and I love this cake. Nystacular: I would totally make my own cake as well :P. I'm glad it was a success. 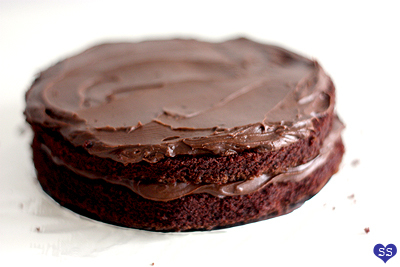 It's definitely the perfect go-to chocolate cake recipe. Thanks for sharing! I love looking at reader's finished products. 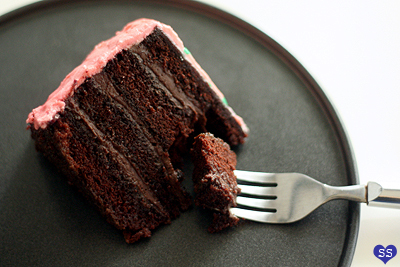 urbanstrawberries: Chocolate cake and reading HP would make an awesome day. So much fun! I just finished making it for my boyfriend's 19th birthday :) Haven't tasted it yet, so hopefully I did it all correct. Super cute! Thank you! Hey ! Thanks for the tribute ! It's so cute ! Hey! !Can I use this dough for cupcakes too?I want to make some very juicy chocolate cupcakes and if yes, do you think it would taste good with the swiss meringue frosting?? ?Btw I absolutely love your blog, have tryed several of your recipes and all turned out to be amazing! !Thank you! what type of flour does it use? heey it's an awesome cake, but how big is the cup that you use? I did the frosting,,it tasted delicious, thank you very much! I don't understand the slicing the round cakes in half like a hamburger bun..
Aren't they supposed to stay circular? because wouldn't the slicing turn it the round cake into half a circle? how would that create 4 layers? hi, is this cake right if i covered it with fondant? I've tried your recipe. No problem with the frosting but the cake was EXTRA moisty hehe. While doing it I noticed it, but I decided to stick to the recipe. With the observed results, I need to ask, what is the function of the boiling water? I assume that it is somehow related with the baking powder. Thanks for your help and your recipe! I've noticed that you've already speak about the matter with another person :-P The thing is, it didn't work out for me at the end. Should I wait some minutes for the baking powder to react before I put the cake in the oven? Hello. I'm baking this cake tomorrow and I'm slightly concerned. In Spain we never use boiling water for baking purposes so I'm afraid about it's moisture. I'm gonna stick to the recipe though. Only problem I have is I won't use two pans but one, but it's taller (I'll have to cut it in four instead of halves, obvs, because I want 4 layers). Thing is, will the heigh affect the consistency? I don't want to take it out of the oven just to see it's not done inside. Or should I just leave it a little longer in the oven, checking it every once in a while to see it's ok and that'll be all? I mean: I don't specifically, absolutely need to use two pans... right? Thank you. And greetings from Spain. It's me again. If anyone is interested, the cake comes out just fine with a taller pan. Just keep it a bit longer in the oven and watch out when you want to stick a toothpick to check its consistence because if you're not quick and it's not done in the middle it goes down faaast! Also, I've notice it tastes really, really, really salty. Too much for me, I wouldn't eat it like that for breakfast. I hope it gets sweeter with the frosting, that should balance the saltiness. God, it was waaay to much for me. my boyfriend and i made this today and it was soo good. i was worried it wouldn't taste good but i was very pleasantly surprised. we also made butter beer and that too was just so good. I want to make this for my sister's birthday! It's great and looks delicious! May I know what kind of oven you use?